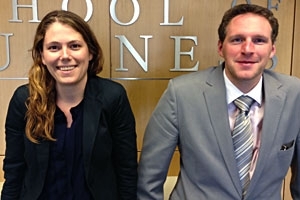 Reneé Ledoux, MA/MBA ’14, and Andrew Olson, MA/MBA '14, are both spending the summer working at D.C.'s Institute for Economic Innovation. From analyzing the financial viability of green roofs to studying the potential of data centers to planning the genesis of a D.C./China jobs incubator, the Institute for Economic Innovation (IEI) is all about finding solutions for economic challenges in the D.C. region. And Andrew Olson, MA/MBA '14, and Reneé Ledoux, MA/MBA '14, are in the thick of it. The IEI grew out of Washington, D.C. Mayor Vincent Gray's efforts to create a Five-Year Economic Development Strategy for the District, a plan developed by his Strategy Advisory Group—a team of area graduate students, elected officials, and leading employers—last summer at the George Washington School of Business. "The program went so well and made such an impact [in 2012] that it was decided to institutionalize the project this year,”" Olson said. Olson, who participated last year as a Mayor Fellow, came aboard as engagement manager this year. He re-joined the project in February, just in time to begin the client acquisition process and scope of work plans. "It was definitely a crash course in getting off the ground quickly," he said. "We had just a few months to get ready to begin our projects and we had to be devoted to preparing human capital. It was a lot of long hours." The Institute is currently working on six projects related to economic development in the region, providing 18 fellows the opportunity to work as real consultants with clients in D.C. and beyond. Olson has "more of a mentorship and guidance role" than he's experienced before, working with the teams of fellows and nurturing client relationships. "This year has been more about seeing the big picture and keeping all steps in perspective as the project moves forward." For Olson, his experience last year and academic experiences since have only reinforced his desire to enter consulting full-time after graduation. "It's the perfect job for a workaholic like me," he said. "It's been a lot of work, but I've loved every minute of it." Ledoux has also confirmed her career plans through the fellowship program at IEI. A career in sustainable and socially-minded work is what drives her. "I've definitely found that work is so much more fulfilling when it's something close to your heart, and this experience has shown me where my heart really lies," she said. "Making a positive economic impact through social initiatives is what I believe in." Among other projects, Ledoux has been working with a team investigating the financial feasibility of green roofs in the region as an efficient way to offset the demand on aging and overwhelmed water infrastructure. "We've been talking with other city planners and people at [the District Department of Environment] to explore what would be the most financially responsible solution to manage the problems that come with aging systems, there's a lot of collaboration going on." During the project, Ledoux has called upon the "soft skills" of consulting she learned during her first year of the MBA program and used them in the field. "I know [my time at Kogod] definitely prepared me for all the client meetings. I know that I can answer any question fired at me, even if that answer is 'I don't know, but I'll find out,' and that shows to these real-life clients," she said. Five of the six IEI projects, including Ledoux's, will wrap up in August, with the last finishing in October.